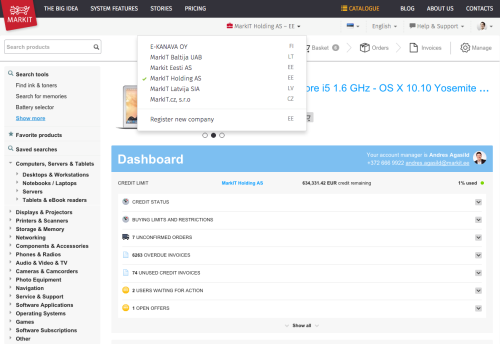 MARKIT – Markit is a tool built for IT purchasing. We help our customers to save time and money. 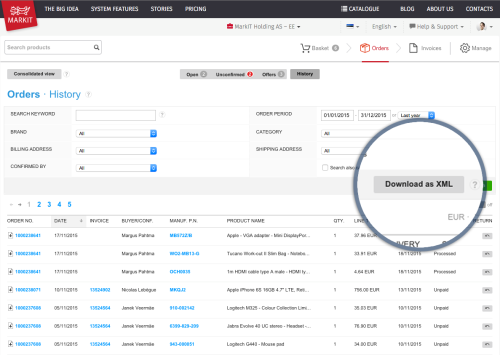 Markit is a tool built for IT purchasing. We help our customers to save time and money. ​Markit is working hard to create and provide an exact solution ​for the everyday purchasing issues in any company and any user level. Over a million unique products in IT and communication categories make Markit one of the largest in the world today. 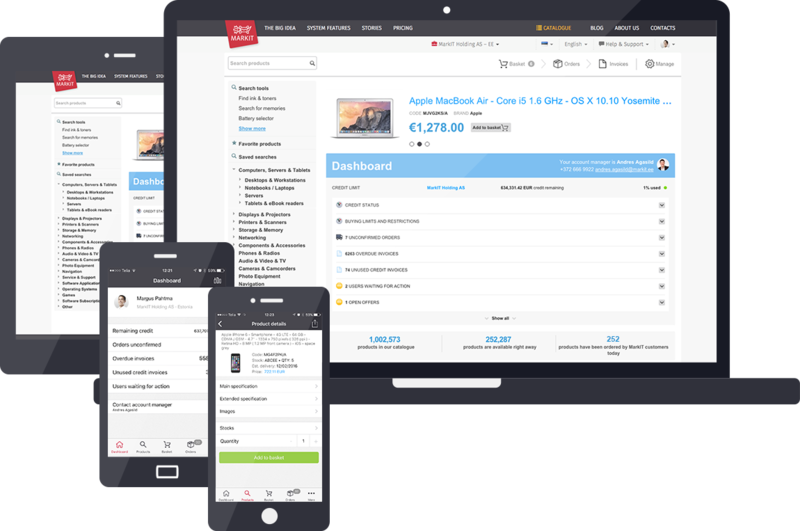 Two million daily updates of price and availability info from the most elite European and USA IT distribution warehouses is matched with extensive technical descriptions by CNET. On top of the local IT distributors there is additional choice and competition from neighbouring countries and specialised international distributors with cross-border deliveries. We bring you three types of advanced search tools to help you find what is needed or to surf around to get new ideas: smart text search across the full catalogue; the product selectors for matching options, cables, consumables and spare parts; and parametric search filters in all categories to filter out the exact solution. For repeat orders and standardising needs of a company the catalogue is equipped with a comprehensive Favourite List tool that works on personal, company and company group levels. One part of the Total Cost of Purchasing is the unit prices you pay for the goods ordered but also the work and time spent to get to those prices. Markit is built up in a way to ensure optimal prices with low effort for each order - and also for each product on each order. It starts with the Multi-Vendor catalogue which brings the whole market with transparent competition of distributors to your browser window - followed by the Quantity Browsing view which dynamically recalculates unit prices for larger quantities and with finishing touch by the Basket Optimizer which is the final check that Markit system performs before check-out to make sure the total combination on the order is optimal. 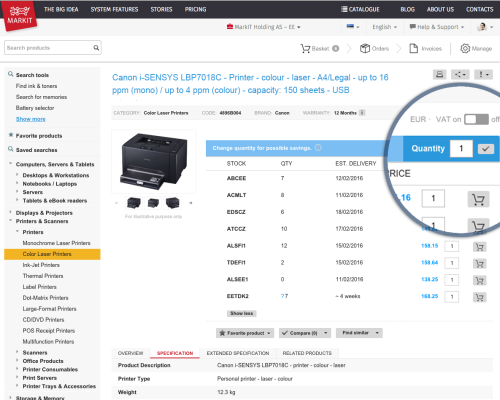 Using the tools in Markit will bring you optimal pricing with very low effort every time. Markit was built with large and complex organisations and purchasing teams in focus. That means among other things that you can easily manage a group of companies with varied set of users in one system, not having to deal with multiple logins or setups by company or country. Setting up order approval workflows and specific limits on users or user groups also comes as standard. You can make Markit your own by eliminating certain categories of products which your organisation is not supposed to order. Markit can be seamlessly integrated with your existing e-procurement setup, platforms like Coupa, Ariba or SAP SRM are all supported for punch out and order/invoice processes. Keep track of the order flow and organise deliveries to different locations within a single country and internationally. 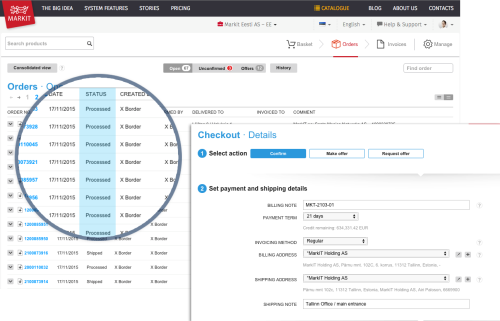 Most orders in Markit have standard track & trace links and there are automatic notifications for any delays. Get an overview of all you orders for all your destination addresses and companies in one view. Add PO numbers and cost centre data to the orders to ensure smooth delivery and invoice acceptance. Every order ends up as an invoice in your accounts payable team at some point, best make sure they come in on time, with all the right comments and in the format most easily processed. E-invoicing is becoming more popular among companies who wish to save costs and automate routines – for that Markit supports most common EDI standards and delivery methods. Leasing and renting agreements can also be integrated into the billing process. No matter which company or companies you use for lease & rent, these contracts can be implemented into the smooth ordering process and will have the same visibility as all your direct transactions. One big benefit of deploying a single system for most orders and over multiple companies is getting better and more thorough purchasing data. In addition to simple standard set like spend by brands, categories and quantities Markit can also build reports about delivery quality, service quality as well as savings reports. Your data is yours - you can always export the order history in standard formats. Markit is built for business customers in all shapes and sizes. 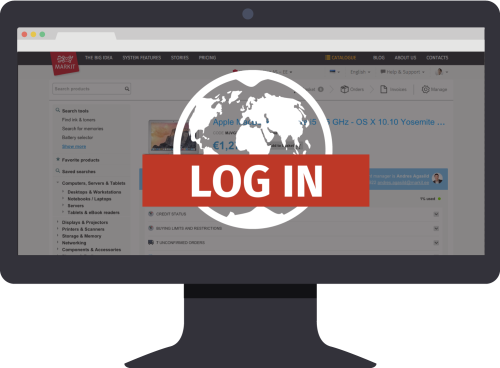 For international customers one login equals access to all markets. Markit is one system not multiple shop sites in different countries so the look & feel and language preferences travel with you. Group contracts and terms are harmonised over all countries involved and special conditions with select manufacturers are honoured everywhere applicable. Group Favourite lists help to standardise on a short list of commonly accepted products in all your subsidiaries while one central Markit account manager will take care of implementation and daily support. Markit site is available in all the local languages of all the countries we operate in - and then some more. We also believe in local customer support as the most effective model. To that end Markit has local teams or native speakers offering support for most of the markets served. For larger and more complex customer implementations over many countries and regions Markit offers one central point of contact in combination with local support. 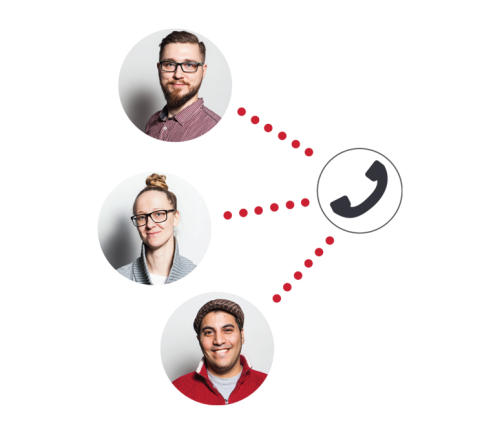 Returns management tools are built into the site and are easy to use, support specialists are available by phone, e-mail or live chat whichever channel best meets your needs.